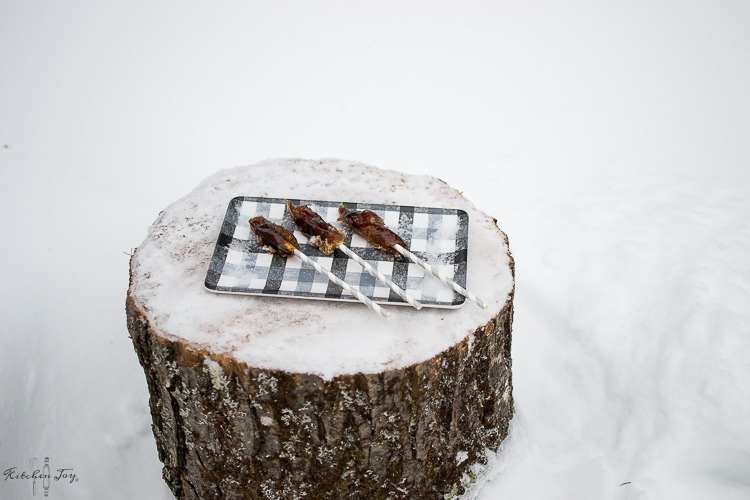 Since the mitten state is pretty much shut down today, I figured it was time that I finally share my recipe for Maple Snow Taffy. It’s so fun to make, and is VERY impressive to little kids. 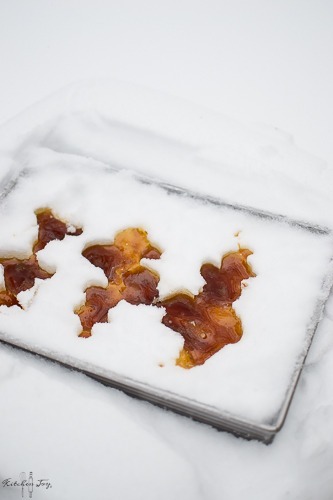 Making maple snow taffy is extremely easy, and super tasty on a beautiful, snowy day. The only actual ingredient is pure maple syrup. 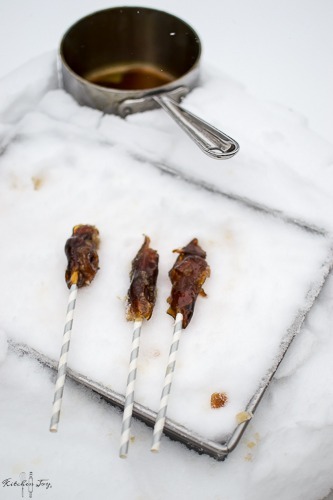 You’ll also need to gather up a pan or tray to pack the snow into for when you pour the maple mixture into the snow to form the taffy. I like to use a metal baking pan. As for the taffy “sticks”, I have found that popsicle sticks, paper straws, wooden party spoons/forks, toothpicks, or pretty much anything can work just fine for rolling up the taffy. 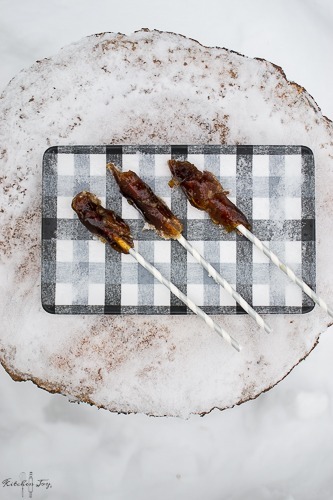 You will need to use a candy thermometer for heating the syrup so you can achieve the soft ball stage. soft ball stage for candy falls between 235°F-245°F. For this recipe, I find that closer to the 245° mark works a bit better. If it doesn’t reach about 240°F or so, I found the taffy to tend to be a bit too soft and can make for a very sticky mess on little one’s mittens. Fill the cake pan with snow, packing the snow down firmly. Leave prepared pan outside while you prepare the syrup. 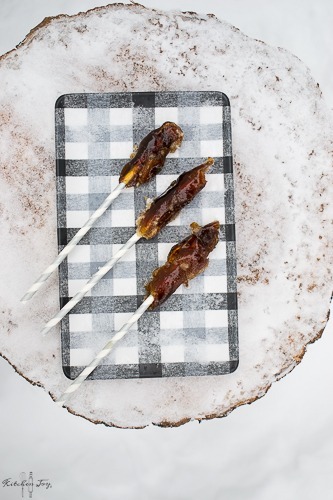 Gather candy sticks, or whatever you’re going to use to form your taffy with. 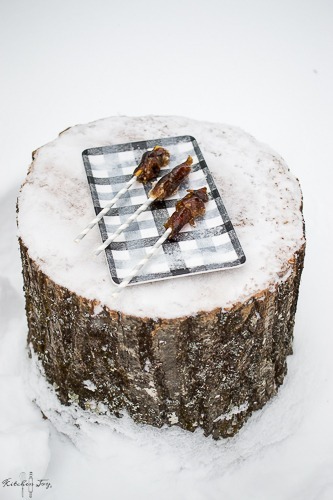 Quickly and carefully take pan of hot syrup outside and drizzle thin lines of syrup onto the prepared snow very close together to make bands of syrup about 1-inch wide by 4 or 5-inches long. Press the sticks/spoons at one end of the syrup and as the taffy cools, gently roll the taffy around the end like a lollipop. Repeat until no syrup remains. Previous Post: « Grateful. Present. Intentional.